The current ISO 4217 code for the peso is MXN; prior to the 1993 revaluation (see below), the code MXP was used. The peso is subdivided into 100 centavos, represented by "¢". As of 14 April 2019[update], the peso's exchange rate was $21.21 per euro and $18.76 per U.S. dollar. 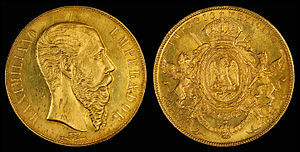 Wikimedia Commons has media related to Money of Mexico.